Our blog will keep you up-to-date on important state government events and GCOA news. 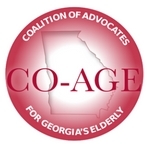 2018 CO-AGE Priorities are Set! Be There 4 Seniors 2017 Success! The Culture Change Network of Georgia Annual Summit is coming up! House Bill 72, The Elder Abuse Bill, passed the House yesterday, the 29th day of the session, by an overwhelming vote of support: 169-0 ! Thank you to all the Aging Advocates that took action on our alert and who came to the Capitol in support.